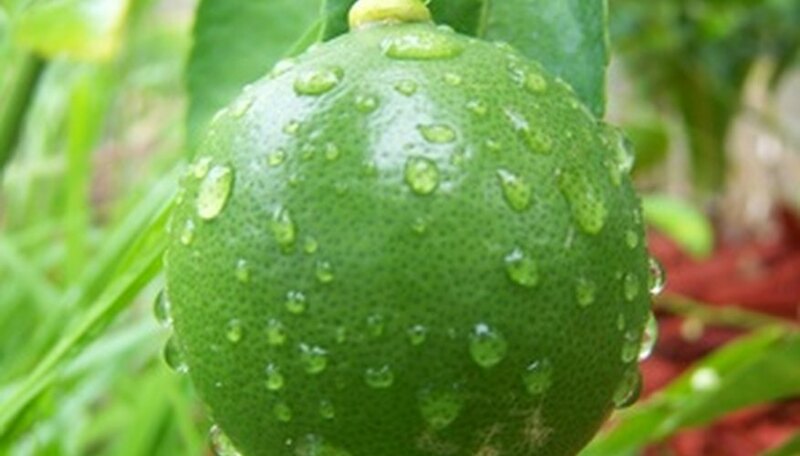 The key lime citrus, also called Mexican lime, is a hardy variety that is native to the Indo-Malayan region. While lime trees are hard to grow in subtropical climates, the key lime will grow in Houston, Texas, as long as care is taken to protect it from periods of freezing weather. Key lime trees produce a glossy foliage and bright green fruit that is used in drinks and desserts. The tree can reach a height up to 12 feet and should be planted in an area where there are not overhead obstructions or within 8 feet of buildings, driveways or fences. Choose a planting location for the lime tree that has a well-draining, nutrient rich soil and a minimum of six hours direct sunlight. The south side of a home is preferred in Houston, Texas, because it gives protection during short periods of cold weather. Test the soil pH to verify that it is between 6.0 and 8.0. Amend the soil with ground rock sulfur to lower the soil pH or limestone to raise the pH if needed. Plant the tree in a hole that is twice as wide and the same depth as the container it came in. Amend the removed soil by mixing an equal quantity of organic compost to increase the nutrient value and water draining ability since most areas of Houston have clay soil. Water the lime tree two to three times a week for the first two weeks after planting. Water the lime tree with a deep soaking when the soil become dry to 1 inch below the surface through the first growing season to assist with establishing the root system. Supply water to established trees as needed when the weekly rainfall is less than 1 inch during the summer months and during periods of drought. Fertilize the lime tree with a granular high nitrogen fertilizer each month from spring through October. Texas soils tend to be low in nitrogen, and lime trees benefit from the supplemental nutrition. Contact your local university Extension office to have a soil analysis completed to verify the type of fertilizer needed for proper growth. Apply organic mulch around the drip line of the tree. This is the soil area from the trunk to the tip of the branches. Leave a 6- to 12-inch gap between the start of the mulch and trunk of the tree to prevent moisture buildup that can harbor disease. Prune dead or damaged branches in the spring before bud formation. Remove shoots that appear on the trunk below the main branches. The key lime tree requires little pruning unless you want to limit its size. Provide cold and freeze protection by creating a soil bank around the trunk of the tree in late November. Pile the soil around the trunk of the tree up to the lower limbs. The lime tree can re-grow from the trunk in the case where a freeze kills the upper portion of the tree. Carefully remove the soil in early spring as the trunk and bark will be tender.